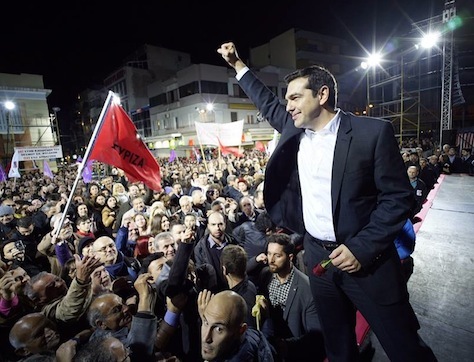 Tsipras, in short, will govern more like a social democrat than a democratic socialist. As prime minister, with the full weight on government on his shoulders, Tspiras will be hard-pressed to deliver appreciable relief from six years of austerity, recession and unemployment. To devote more funding for public services and boost growth will require a very different skill set than the campaign oratory of the past three years. Tsipras is already showing signs that he hopes to build a broad coalition to change course, and he’s rumored to be considering former Greek prime minister Kostas Karamanlis as SYRIZA’s candidate for president. Karamanlis, who served between 2004 and 2009, comes from the center-right New Democracy (Νέα Δημοκρατία), but he has been critical of Samaras, the party’s approach to the bailout and what Karamanlis has called the Samaras campaign’s ‘scare tactics’ in the current election. Even if SYRIZA wins a narrow majority in the 300-member Hellenic Parliament, he may reach out to build an anti-austerity coalition government with like-minded conservatives like the Independent Greeks (ANEL, Ανεξάρτητοι Έλληνες), the new centrist To Potami (Το Ποτάμι) or even the Communist Party of Greece (Κομμουνιστικό Κόμμα Ελλάδας), from which SYRIZA splintered a decade ago. Greece’s next government was already obligate to negotiate with the European Union and the IMF over an additional €16 billion in financing that will see the Greek treasury through 2015 and 2016. Those negotiations, even if Samaras had won today’s election, were never going to be easy. Moroever, Tspiras and SYRIZA’s economic advisers are stating publicly what even austerity-minded Europeans already concede in private — that EU leaders will have to write off at least some of Greece’s €320 billion in public debt and extend the term of Greece’s bailout program significantly to help Greece avoid crushing interest repayment obligations. Tspiras must first assuage other European leaders and the international markets that he is serious about keeping Greece in the eurozone. He must then convince those same EU leaders to deliver more relief than they have so far been willing to provide to a much friendlier Samaras government. German leaders have been talking tough about Greece in the leadup to the latest election, even to the point of affecting nonchalance about a Greek eurozone exit. While no one exactly expects a ‘Grexit,’ there’s no guarantee that Tsipras will reach an agreement with EU leaders who face grumbles that their own constituencies have paid enough for Greece’s debt woes. The likeliest result in the months ahead is that Tspiras may cut taxes slightly or boost spending or public-sector employment. He, too, may win some additional debt relief from wary European leaders, and ECB president Mario Draghi’s announcement last week of significant quantitative easing at the European level may yet give Tsipras and the Greek government additional flexibility. But his government is likely to share much continuity with the Samaras government’s approach. That could disillusion Tsipras’s hard-won supporters and, at worst, could splinter SYRIZA, a former coalition of leftist parties that only in recent years merged into a unified movement. None of this should lessen the momentous nature of SYRIZA’s victory, which marks a turning point in the ongoing European debate on economic policy within the eurozone. As prime minister, Tsipras has made it clear that he will be a loud champion for pro-growth policies, especially throughout southern Europe, where unemployment and recession have taken the worst toll. As the Greek campaign ended, Tspiras took the stage with Pablo Iglesias, the young firebrand who leads Podemos, a new leftist, stridently anti-austerity Spanish political party that now leads polls in advance of national elections later this year. Tspiras’s victory will give momentum to calls from French president François Hollande and Italian prime minister Matteo Renzi for more growth-oriented policies, to the dismay of the more conservative approaches of leaders like German chancellor Angela Merkel and British prime minister David Cameron. But EU leaders condemn and ignore the rise of Tspiras at their risk. With far-right, anti-immigrant populists like Marine Le Pen growing in strength in northern Europe, Tsipras and the new European left argue that higher taxes, budget cuts and policies that target debt reduction are endangering the core values that united Europe for decades.